As we continue to search for profitable ways to expand the manure application window in Ohio, we have begun to research dragline application of manure to growing soybeans. While this would potentially open up more time for manure application in the spring, our initial research goal is to look at the ability to apply manure to emerged double crop soybeans after wheat. 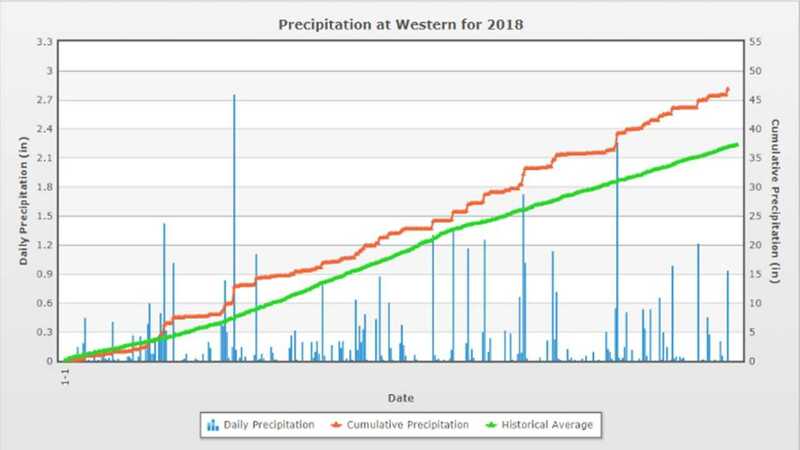 For many years, livestock producers have successfully applied liquid manure to newly planted soybeans in July to help provide moisture for germination and emergence. In 2018 we conducted trials at Western and Northwest OARDC to determine the yield effects a loaded 5 inch drag hose would have on growing soybeans. Plots were 30 feet wide and 90 to 2000 feet long. Plots were harvested with a small plot combine with a two-meter head allowing us to look at damage caused by the drag hose versus damage caused by the tractor tires. At every growth stage wheel damage was evident, with a trend of lower yields in the center where wheels were. It may be beneficial to use tracks or at least a non-dualed tractor to minimize wheel damage. A five inch loaded drag hose was utilized in the study and each plot was drug once to best represent real field damage. Each location had either two or four replications and also had an untreated check. Both locations saw minimal visual damage from the dragline at soybean growth stages through V3. At the V5 stage there was a noticeable curve to many of the soybean plants. At the V7 stage, most of the soybean plants were partially broken off at the ground level but continued to grow and produce pods. None of the replications had treatments statistically different than the untreated check. 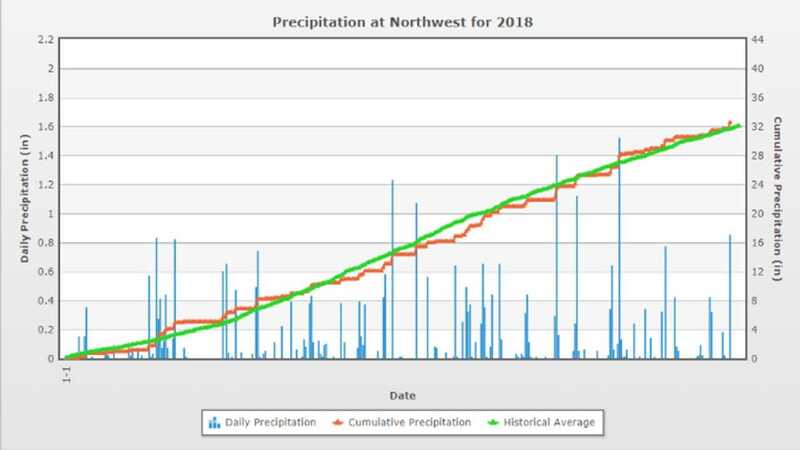 Both sites had plentiful rainfall in the months of July, August and September. This moisture may have masked yield damage from the drag hose. Soybeans had plenty of moisture to recover from damage by putting out more branches. It is important to remember that no manure was applied to the soybeans, which we will focus on in the coming years. We know that manure may have a high enough salt content to kill soybeans. In previous field trials, we have seen instances where banded manure before soybean planting killed the soybeans in those strips. Work done by the University of Nebraska looking at using manure through a center pivot irrigation system studied how salt content of the manure effects soybeans. 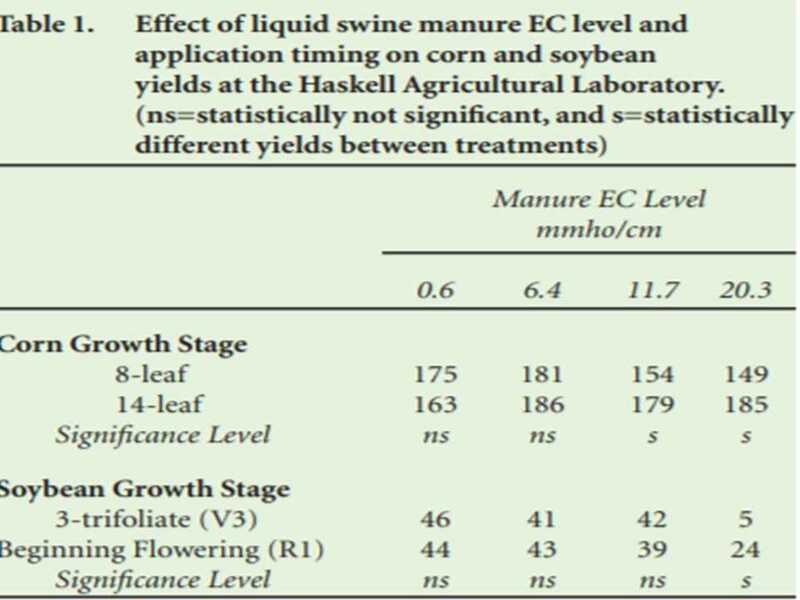 This study looked at applying a half-inch (13,577 gallons) of manure at the V3 or R1 growth stage. Electrical Conductivity (EC) was used to tell how much salt was in 2728 samples of liquid swine, dairy, and beef manure from covered and open lagoons. Manure from under a swine finishing barn had an EC was 20.3 decisiemens per meter (ds m-1) and was used as the base manure for all treatments and diluted with water for lower EC treatments. Seventy five percent of the samples had an EC of 11.7 ds m-1 or less. The treatment with an EC of 20.3 saw a significant decrease in soybean yields compared to all other treatments. Treatment with an EC of 11.7 and all treatments below this level had similar soybean yields. Plots showed foliar necrosis at the 11.7 EC treatment and plants were shorter than lower EC treatments but yield was not affected by this damage. Prior research has shown an EC salt threshold of 6.4 ds m-1 for soybeans at the V3 growth stage and younger. Gallons per acre and weather conditions can greatly affect the damage done to soybeans from manure application. When combining these two studies it will be important to have a current manure analysis to know the EC or salt content of the manure. Especially with manure from under barn, swine storage facilities. The higher the nitrogen and potassium level, the higher the salt content. The study on drag hose damage shows that soybeans can handle incredible stress, the real test will be to combine the two stress factors. Over the next couple of years, we will continue the work on the potential to dragline soybeans with liquid manure looking at both damage from the drag hose and the manure itself. The authors wish to thank the Ohio Soybean Association for sponsoring this research. C. A. Shapiro, W. L. Kranz, C. S. Wortmann. 2005. Salt thresholds for liquid manure applied to corn and soybean.